The Paleofuture blog looks back at past projections into the future, an exercise that is usually instructive in one way or another. 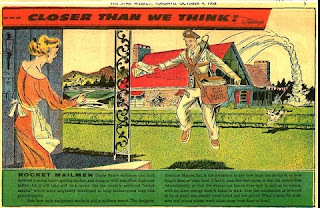 A few months ago (17 June 2011) it had a feature on a picture of “Rocket mailmen” which had been published in Arthur Radebaugh’s Closer than we think, 4 October 1958 (image left). 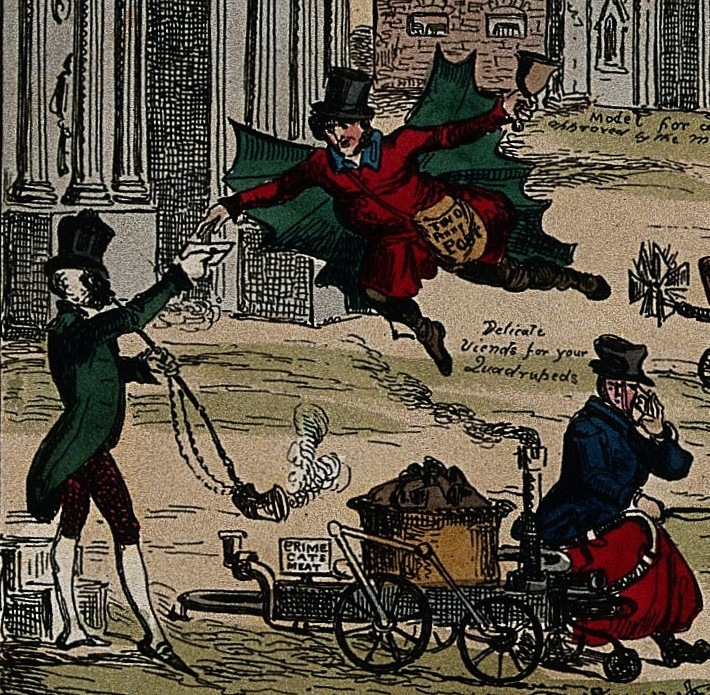 To travel that final distance to deliver the mail to its recipient, the postman flies through the air, with the aid of jet propulsion equipment on his back. 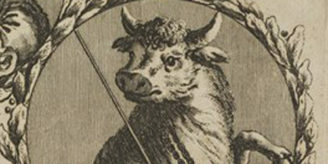 As a sign of her status, the housewife receiving her post has a verandah supported by an elegant Georgian-style iron trellis. The idea of the flying postman had appeared in a futurological vision from the actual Georgian period in England, published in May 1829 (a decade before Sir Rowland Hill’s idea of the Uniform Penny Post was introduced in 1840). 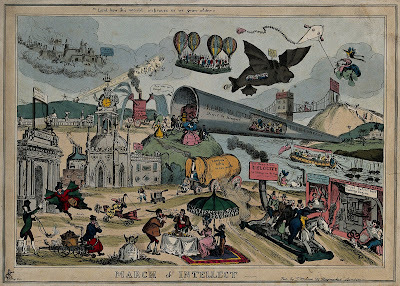 This vision was the “March of intellect”, a satire by Paul Pry (pseudonym of William Heath, 1795-1840): click on the image above to see details. 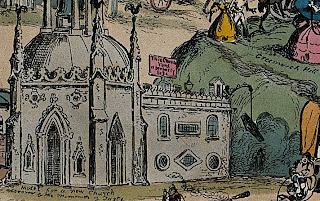 Heath’s print made fun of the movement associated with Jeremy Bentham, Lord Brougham and the Wellcome Library’s former neighbours at University College London who used the phrase “March of intellect” or “March of mind” as a promotional slogan for their belief that mass education and technological progress would solve the problems of society. a pneumatic tube takes passengers from Greenwich Hill to Bengal; there is a suspension bridge between Bengal and Cape Town; a giant flying fish takes convicts from England to New South Wales; and Irish emigrants are fired from a cannon. And in the lower left corner, a postman equipped with wings collects a letter for delivery by the “Twopenny post” (image right). His wings resemble bats’ wings, but any resemblance to Batman is coincidental. Lord! how this World improves, as we grow older! Another is the use of technology to accomplish tasks that a better-organized society would not need to bother about in the first place. 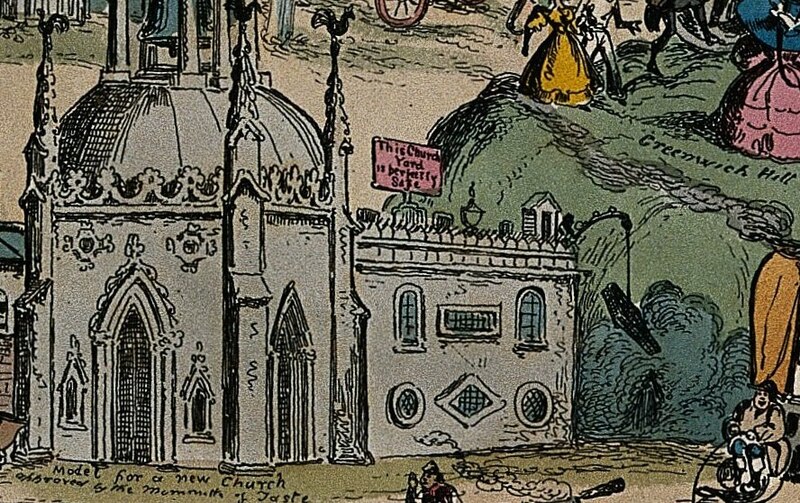 For example (image right) coffins are lifted by crane up on to the roof of a church for burial in order to foil body-snatchers: Heath’s print was probably published in May 1829, and William Burke, the Edinburgh body-snatcher and murderer, had been hanged on 28 January 1829. The organization of manual postal deliveries is controversial in many countries. 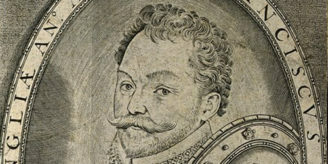 In Switzerland, a division of opinion as to how the Swiss post should manage it led to much rancour and the resignation of the chief executive in 2010. In the Netherlands, according to an article in the London Review of Books , the privatised mail service has dispensed with local sorting offices: instead, crates of unsorted mail for a given area are delivered to the flats (apartments) of the postmen and postwomen, who then sort the mail on their beds or on the work surface next to the kitchen sink before setting out with it for house-by-house deliveries. Crates full of letters and parcels that are undelivered to their intended recipients owing to illness or family problems tend to clutter up the home of the delivery person until the time when their contents can be delivered (if ever). Electronic communication is of course one solution to the problems of hard-copy delivery. Its potential is imagined in the widely-circulated video “A day made of glass” produced in 2010 for the Corning Inc. glass company. 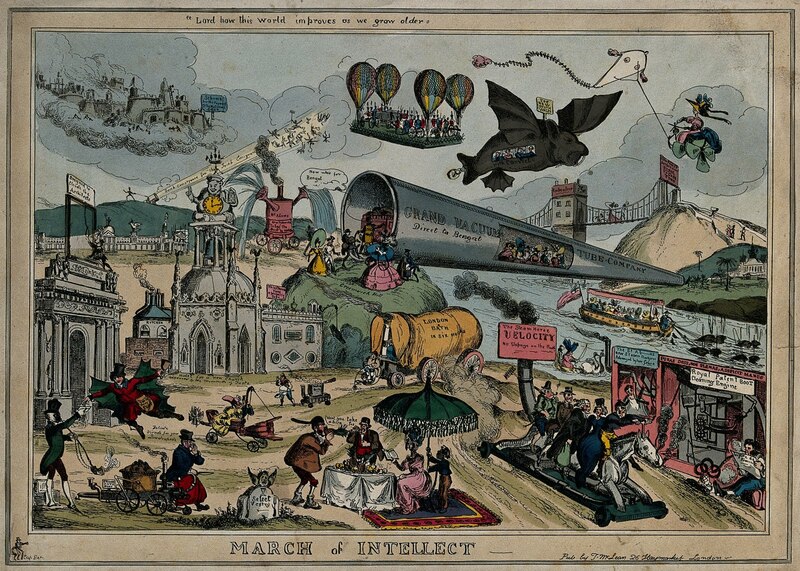 Their vision reveals a future almost as fantastic as William Heath’s “March of intellect”. There is no mention of the information overload that tends to follow enlargement of the information pipeline. And, as James Weinheimer remarked when he introduced this video to the discussion list NGC4LIB, the people shown in the video are (like the 1958 lady with her wrought-iron trellis) the fortunate and the wealthy rather than the typical population. Still, Corning’s magic glass could obviate the need for the long-imagined flying postman of the future.